Can the student disable or “hack” Mythware? – Planet TechEd Inc.
Can the student disable or “hack” Mythware? 1. Log in and connect with the students consoles. The main concern when it comes to Classroom Management solutions is that the students may find a way to hack into the system and simply log out. With Mythware Classroom Management Software there is no way to do that and here we show you how to make sure that never happens. There are a few steps the teacher can do in order to secure the connection even more. Log in and connect with the students consoles. 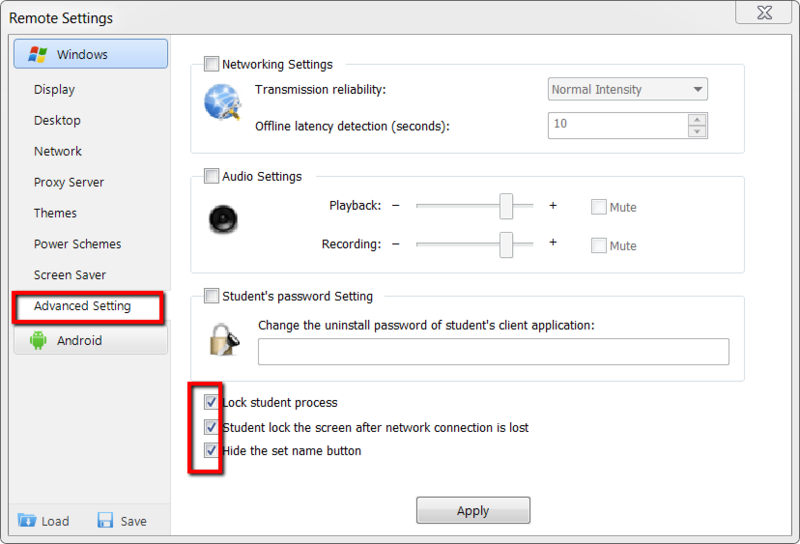 Go to “Remote Command” –> “Remote Settings” on the teacher console. After clicking on “Remote Settings” a new message box will show up. In “Advanced setting” you will see at the bottom, the 3 options you must select in order to make sure no student will close the software or find a way around it. 4. After selecting these 3 options, just click on “Apply” and the student won’t be able to close the software. If the student tries to close the software from the task manager, a new message box will show saying he can not end the task. I get an Error Code 5 when I try to activate Mythware Classroom Management. How can I fix this? How do I check if our router supports Multi-cast transmission? What if it doesn’t?